Life comes with three certainties: death, taxes, and Albertans driving F-150s. We love them. It’s not uncommon to drive into a neighbourhood (any neighbourhood) and see ten pick-up trucks. And at least five of them will be F-150s. Why? Because as our 2018 Ford F-150 review will show you, this truck isn’t just for blue collar workers anymore. Ford’s truck brand marketing manager, Todd Eckert, has described F-150 owners, not as those who are extremely likely to tow or haul, but as people who are likely to “serve and help others”, “leave the world better than they found it”, “leave a legacy in life,” and lead “multidimensional lives” characterized by both work and play. In other words: F-150 owners live good Albertan lives. 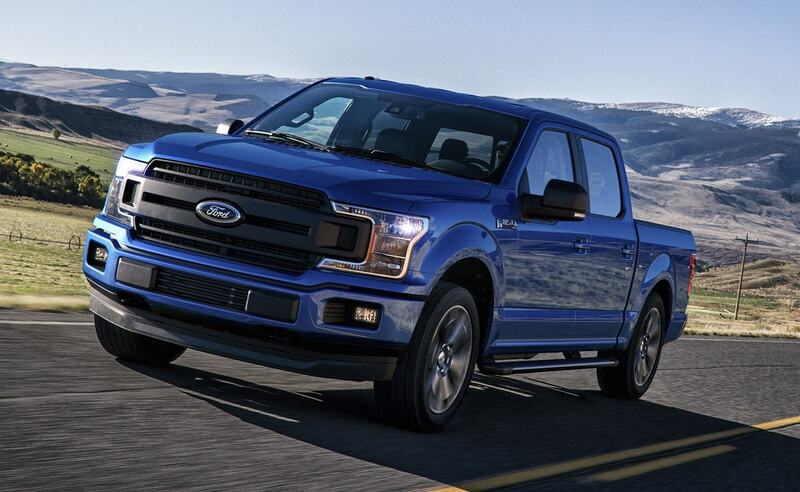 The 2018 F-150 was recently named the 2018 MotorTrend Truck of the Year, and unsurprisingly, more than 140,000 Ford F-Series trucks were sold in Canada in 2017. Over the last 51 years Ford’s F-150 reigns as Canada’s top selling pick up truck and it’s for good reason. Now in its thirteenth generation, the 2018 F-150 is only becoming more powerful while maintaining its status as best in-class for towing (up to 13,200 pounds with the 3.5L Eco Boost), payload, and fuel efficiency. Moreover, a new diesel edition of the F-150 is set to release in Summer 2018, and it’s creating potential for even greater competition with other similar makes currently using diesel models. The new 2018 Ford F-150 is available in 7 trims: XL, XLT, Lariat, King Ranch, Platinum, Limited, and Raptor, 14 colours, and 6 new wheel options. The new Ford F-150 certainly justifies the incredible unit sales with exceptional exterior cosmetic enhancements including tail light changes resembling the SuperDuty, body colour bumper in the Lariat trim and higher, standard F-150 stamped on the rear, and four new exterior colours, among 10 existing colours. Halogen headlights are also standard in XL, XLT, and Lariat trims, with Quad Beam LED lights in the King Ranch trim. The cargo bed comes in 3 sizes: 5’6”, 6’6”, and 8’. The cabin comes as either the Super Cab at 33.5” or the Super Crew at 43.6” which provides a ton of leg space and extra storage area (if you push the seats up). It’s worth noting that the largest cabin (Super Crew) is not available with an 8’ cargo bed. Remote tailgate release is an enticing feature of the King Ranch edition and above, providing a smooth release of the tailgate. The 2018 F-150 has two interactive screens, making this an incredibly user-friendly ride. It has an 8” touch-screen on the dashboard, as well as a 4.5” screen (or 8” in King Ranch) at the centre of the dash. The B&O sound system is exceptional and includes subwoofers in the back seats. Even better, it comes with Apple CarPlay or Android Auto. Another exciting feature is the heated and cooling seats, and heated steering wheel. These make for a comfortable experience in both the chilling winter months and sticky summer months. Quite simply, the F-150 presents a luxurious interior with a roomy cabin. Two new interior colours (Navy and Marsala) are among several options available, making the F-150 feel just as powerful inside as it does outside. The cabin is incredibly spacious for the passengers. So spacious and comfortable that no one’s going to call shotgun (unless you get massage seats). The High-Output 3.5L EcoBoost V-6 is the 2018 F-150’s most powerful engine, boasting a class leading max towing capacity of 5,987 kg as well as 450 HP and 510 lb-ft of torque. Though a step down from the 3.5-litre V-6, the 5.0-litre Ti-VCT V-8 is no joke either. Revamped and reengineered to produce more power and operate more effectively than before, this engine can deliver up to 385 HP and 397 lb-ft of torque for a maximum towing capacity of 3,561 kg. Like the rest of them, the 2.7-litre EcoBoost V-6 features leading-edge technology, and in terms of torque, it packs a punch at 400 lb-ft. In terms of fuel efficiency, the F-150 is near the lead of the pack. At its best, it can manage 11.9 L/100 km (24 mpg) in the city, and 9.0 L/100 km (31 mpg) on the highway for a combined 10.6 L/100 km (27 mpg). Consequently, you’re not sacrificing much power to save yourself a ton of money at the pump. Perhaps more exciting, though, is what’s to come for the very first time in its history this coming spring: the F-150’s very first diesel engine. As of now, details still remain limited, but it’s said that it will be a 3.0-litre V-6. Whatever happens, I think we can all be excited by the notion of Ford finally joining the ranks of the half-ton diesels. Receiving top scores from the National Highway Traffic Safety Administration (NHTSA) and the Insurance Institute for Highway Safety (IIHS), the 2018 Ford F-150 is one of the safest full-sized pickups on the market. Keeping with the trend of the day, the 2018 Ford F-150 is filled with a ton of available active-safety and driver assist technologies. It offers adaptive cruise control that can bring the truck to a complete stop and accelerate again for stop-and-go traffic jams, as well as a new pre-collision warning system that incorporates pedestrian detection and emergency braking that will warn drivers prior to the vehicle automatically braking in order to mitigate impact. Additionally available is the handy Pro Trailer Backup Assist that makes backing up a trailer a simple matter of turning a knob. Needless to say, there are few pickups out there that can rival the 2018 F-150 when it comes to safety.